International Night 2019 was absolutely fantastic! As always, International Night was a strong testament to our school's commitment to our core value of Global Awareness. 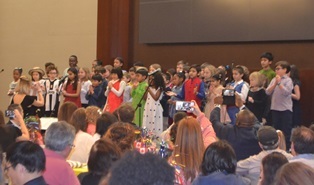 Kudos to Music Teacher Carissa Gibson and all the students for a beautiful musical program. Thank you to all the families who braved the traffic to attend, bringing such delicious food. And thank you to the volunteers whose many hands made light work of set-up and clean-up. Our school is only as good as our community - and it's obvious this is a great place! Look for more pictures on Facebook.